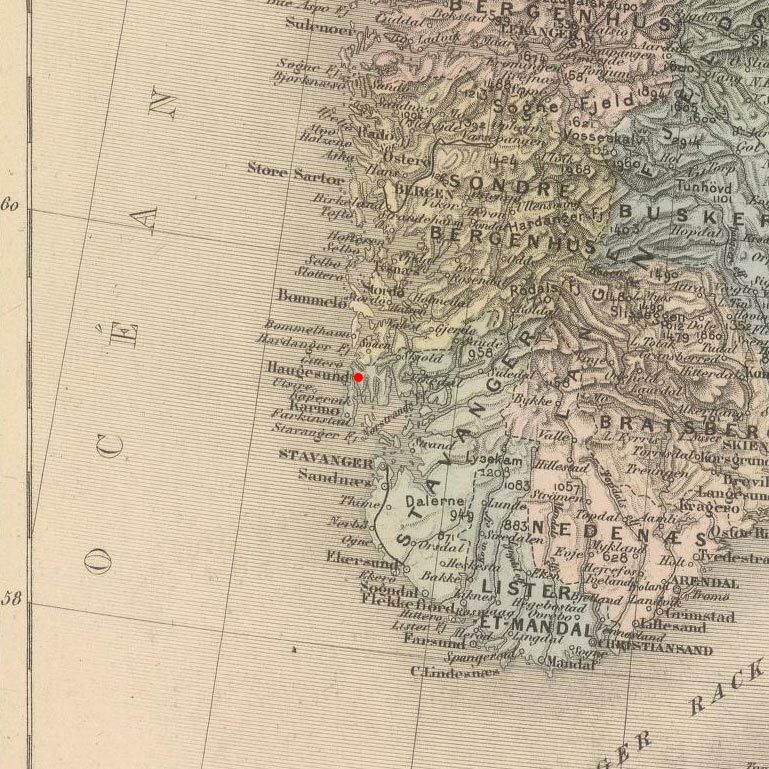 Thora grew up in Haugesund, Norway at “Sørhauggade 121b - Farmhouse” with her parents, 3 brothers Karl, Olaf & Adolf, and sister Anna.2 Her father was a sailor and engineer in the Norwegian shipping industry which put him at sea for long stretches of time while her mother stayed at home raising the children. Arrival Manifest, Pg.1 (1914)On 23 Jan 1914, Thora boarded the brand new S.S. Kristianiafjord and departed from Stavanger, Rogaland, Norway. Final destination: America. The S.S. Kristianiafjord was built by Cammell Laird & Co. in Birkenhead, England the previous year. 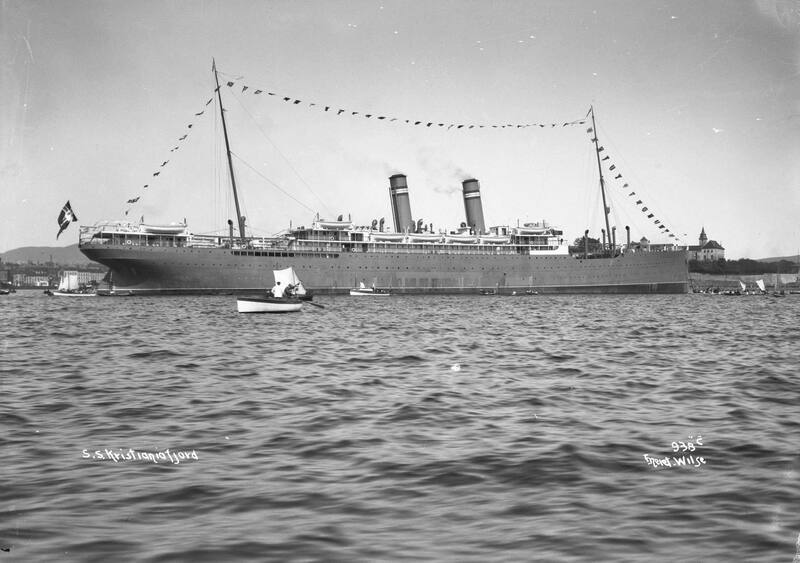 It weighed 10,669 gross tons, was 530 feet long, 61 feet wide and carried 1,200 passengers (100 first class, 250 second class & 850 third class) at a speed of up to 15 knots. 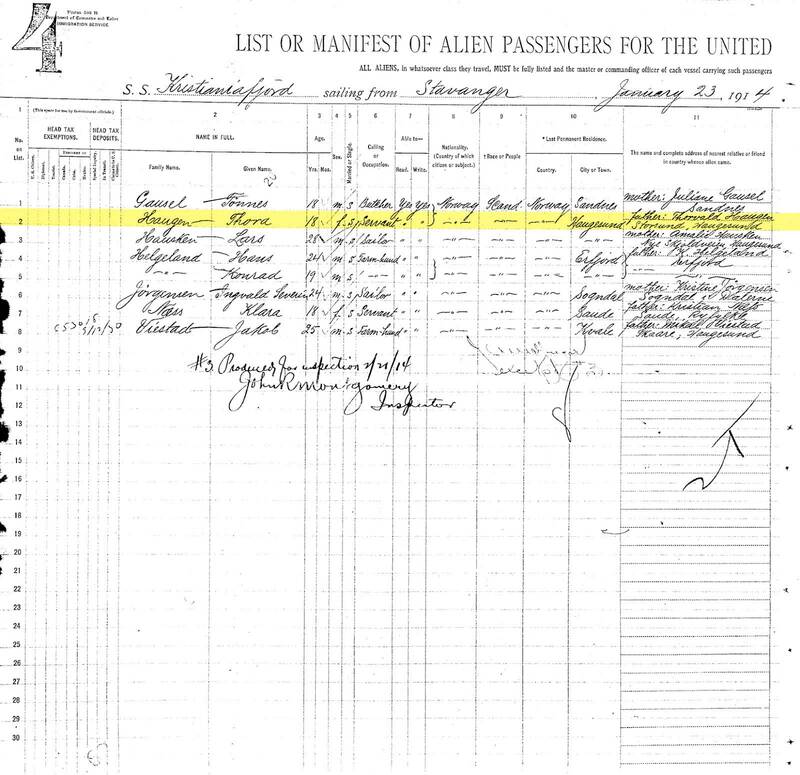 Her passage over was paid for by her sister Anna Haugen who had already arrived in Cleveland. 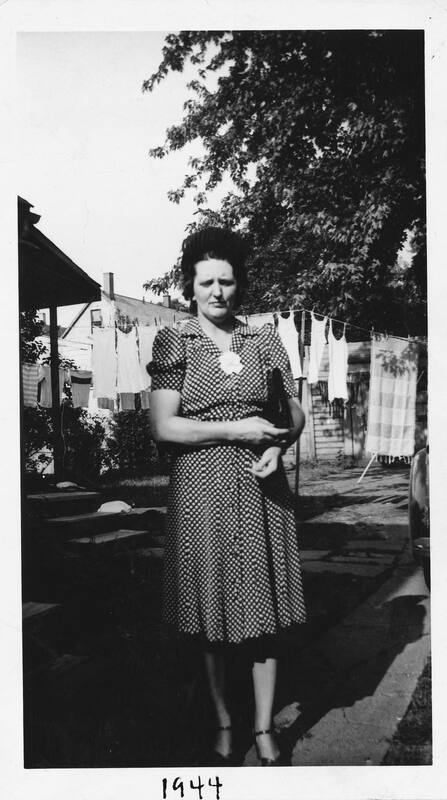 Her first residence was with her sister Anna, at 2045 W 25th Street in Cleveland. 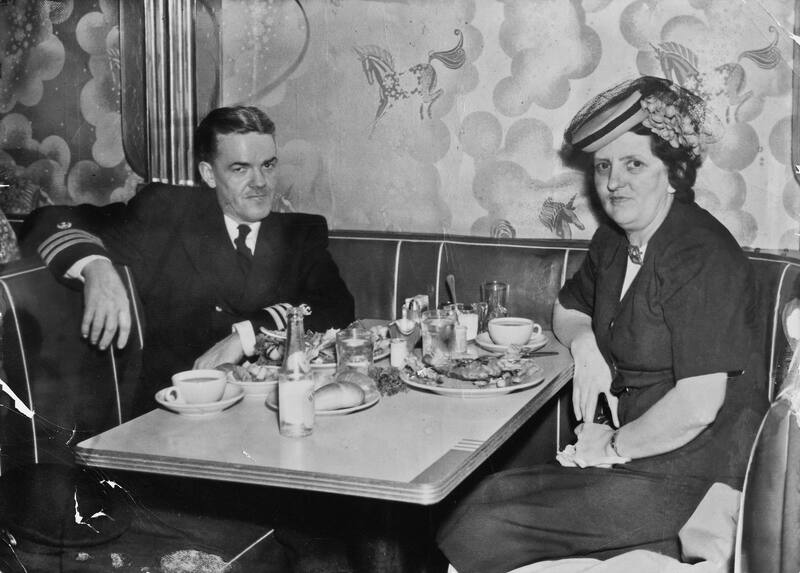 We're not certain how Christopher and Thora met but, by 1917, Thora had moved and was living at 6609 Linwood Avenue which was only about a mile north on 71st street from Christopher's family at 2275 East 74th Street. 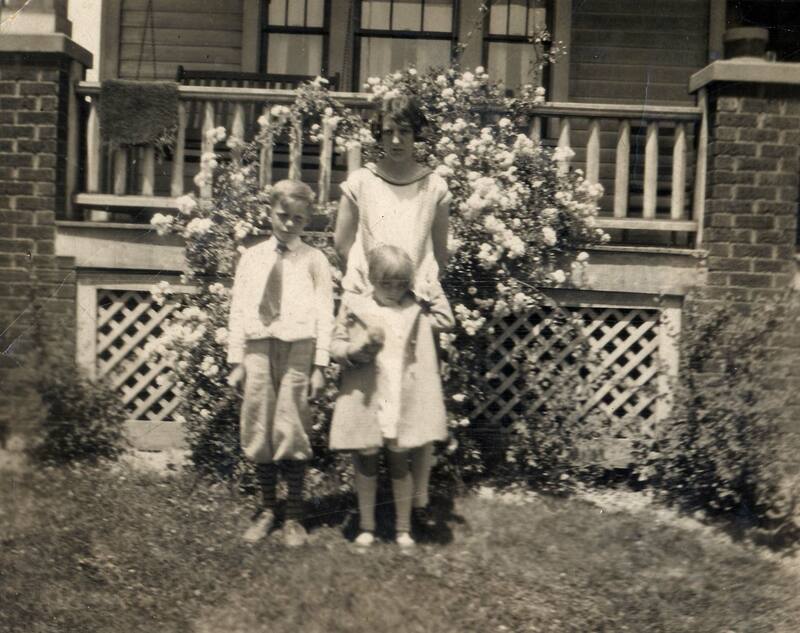 After Christopher and Thora’s marriage, they moved into a rental property at 1915 West 73rd Street.9 In 1921 they moved to 4214 Trowbridge Ave.10 and in 1922 they moved the family again where they were found at 2045 Spring Road, all in Cleveland.11 About 1924 Christopher was able to finally purchase a house at 3343 Lincoln Avenue in Parma where he would raise his family. Christopher became ill while working as a First Mate for the Steamship W.C. Atwater, and about May of 1928, it was determined through clinical findings that Christopher had a carcinoma of the lung, better known as lung cancer. Things went from bad to worse about March the next year when the doctors had more troubling news: they had discovered that the lung cancer was metastatic, meaning that it wasn't the originating form of cancer, just a secondary location that the cancer had spread to. They had now discovered that Christopher had a carcinoma of the Nasophpharynx. Thora HansonThe Nasopharynx is the area located behind your nose & above the back of your throat. This type of throat cancer is extremely rare in the US today and hard to diagnose, meaning it was very advanced by the time they were able to diagnose it. Cancer had no treatments or cures in the 1920s as radiation and chemotherapy treatments had not been invented yet. All Christopher could do was return home and continue living his life. After Christopher's death, Thora's brothers Karl & Olaf and sister Anna Morley moved in with Thora to help support her and possibly to take care of her and her children Robert and Virginia during this difficult time. 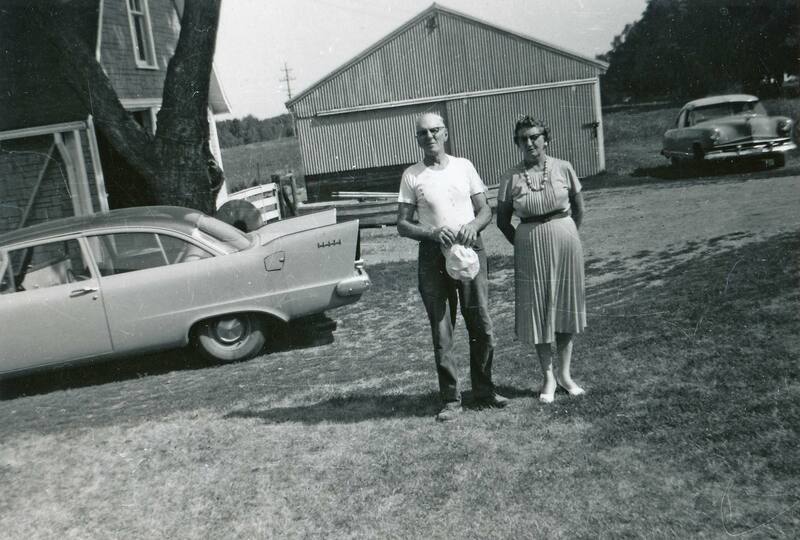 Olaf owned a repair garage in town; Anna managed a knitting mill; and Karl worked as a night watchman at Anna’s mill while visiting.14 The support helped, but it wasn’t enough and Thora eventually lost the family house on Lincoln Avenue. 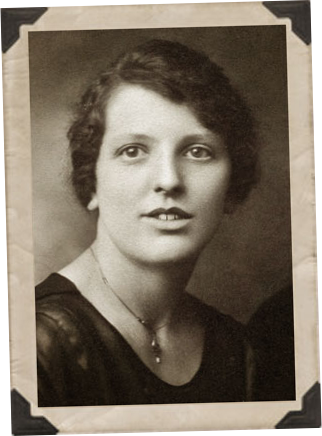 Thora died on 11 Oct 1992 at 06:20 PM in Middleburg Heights, Ohio of cancer at the age of 94.16 She was laid to rest at West Park Cemetery on Ridge Road, Section 21, Lot 219, Grave 3, between her husbands Christopher Lowe and Henry Hanson. A A video of promotional footage of the S.S. Kristianiafjord sailing between Norway and America can be found over on YouTube. 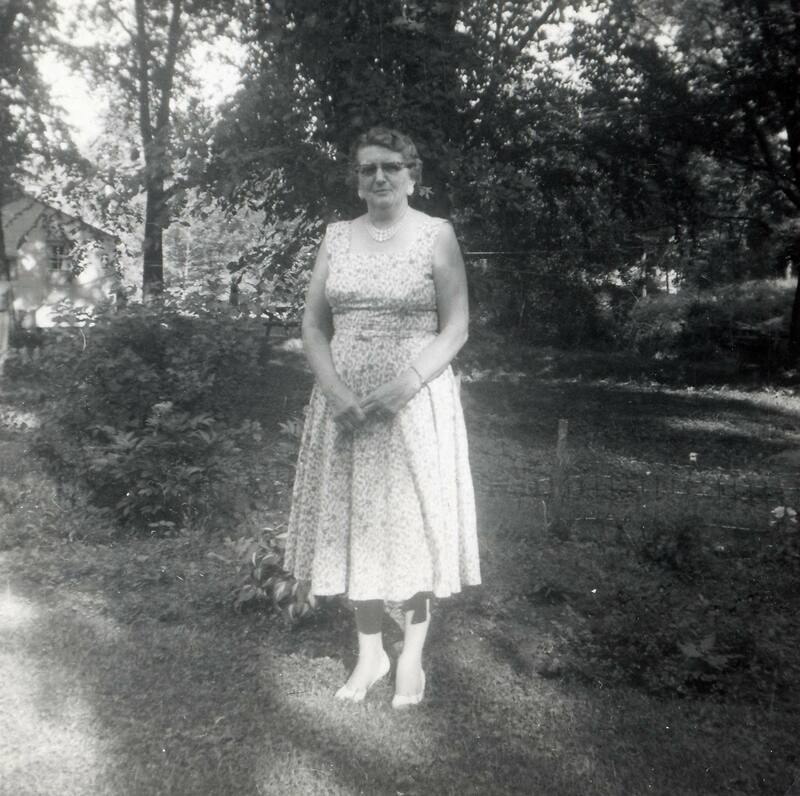 1 Norway Parish Registers, Baptism Records about Thora Marie Haugen; The National Archives of Norway: The Digital Archives; Oslo, Norway; (http://www.arkivverket.no/URN:kb_read?idx_kildeid=3048&idx_id=3048&uid=ny&idx_side=-89); Visited:13 Jan 2014 ; Rogaland county, Haugesund, Parish register (official) nr. 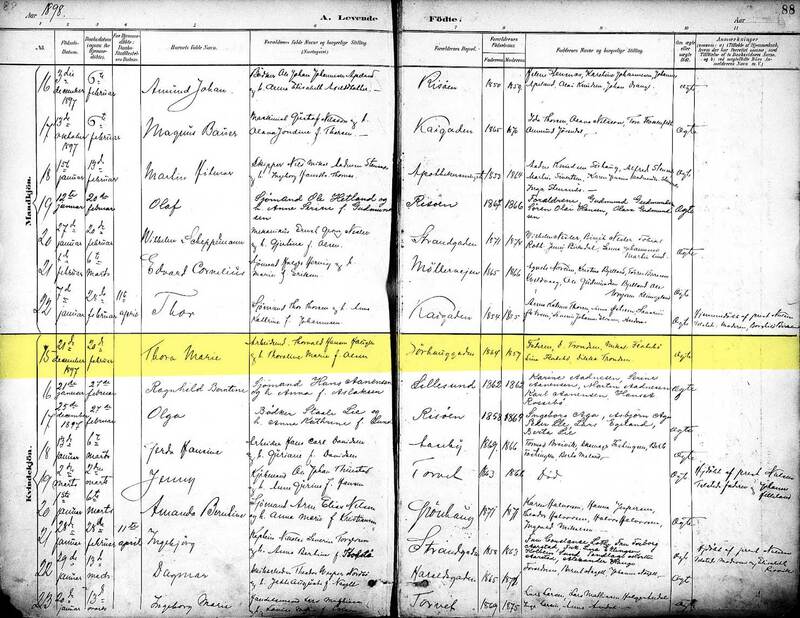 A 6 (1891-1907), Birth and baptism records 1898, page 88. 2 1900 Norway Census about Thora Marie Haugen; The National Archives of Norway: The Digital Archives (Digitalarkivet); Oslo, Norway; (http://digitalarkivet.no/cgi-win/WebCens.exe?slag=visbase&sidenr=1&filnamn=f01106&gardpostnr=337&personpostnr=4391&merk=4391#ovre); Visited:13 Jan 2014 ; Rogaland county, Haugesund, Census of Haugesund; Family No. : 337; Entry No. : 4391-4397; House No. : 38. 3 Norway Parish Registers, Death Records about Torvaldine Marie Haugen; The National Archives of Norway: The Digital Archives; Oslo, Norway; (http://www.arkivverket.no/URN:kb_read?idx_kildeid=1768&idx_id=1768&uid=ny&idx_side=-175); Visited:13 Jan 2014 ; Rogaland county, Haugesund in Haugesund, Parish register (official) nr. A 7 (1904-1916), Death and burial records 1907, page 185; Entry No.:31. 4 Norway Parish Registers, Marriage Records about Torvald Haugen; The National Archives of Norway: The Digital Archives; Oslo, Norway; (http://www.arkivverket.no/URN:kb_read?idx_kildeid=1768&idx_id=1768&uid=ny&idx_side=-114); Visited:13 Jan 2014 ; Rogaland county, Haugesund in Haugesund, Parish register (official) nr. A 7 (1904-1916), Marriage records 1908, page 124; Entry No.:15. 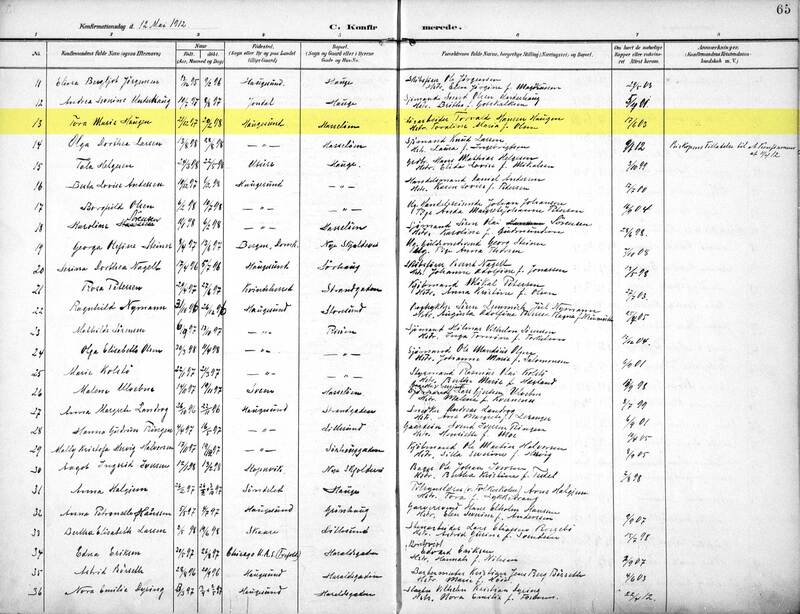 5 1910 Norway Census about Thora Marie Haugen; The National Archives of Norway: The Digital Archives (Digitalarkivet); Oslo, Norway; (http://da.digitalarkivet.no/ft/person/pf01036618009438/); Visited:13 Jan 2014 ; Rogaland county, Haugesund, Census of 1910 for 1106 Haugesund kjøpstad, 36618; House No. : 19; Entry No. : 006; ID. : pf01036618009439. 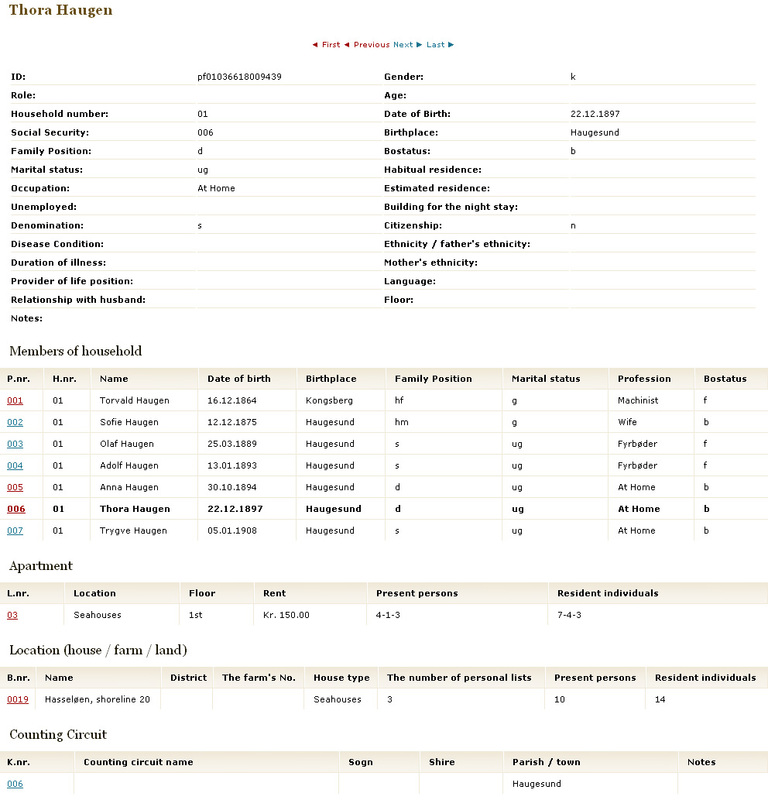 6 Norway Parish Registers, Confirmation Records about Thora Marie Haugen; The National Archives of Norway: The Digital Archives; Oslo, Norway; (http://www.arkivverket.no/URN:kb_read?idx_kildeid=1768&idx_id=1768&uid=ny&idx_side=-67); Visited:13 Jan 2014 ; Rogaland county, Haugesund in Haugesund, Parish register (official) nr. A 7 (1904-1916), Confirmation records 1912, page 65; Entry: 13. 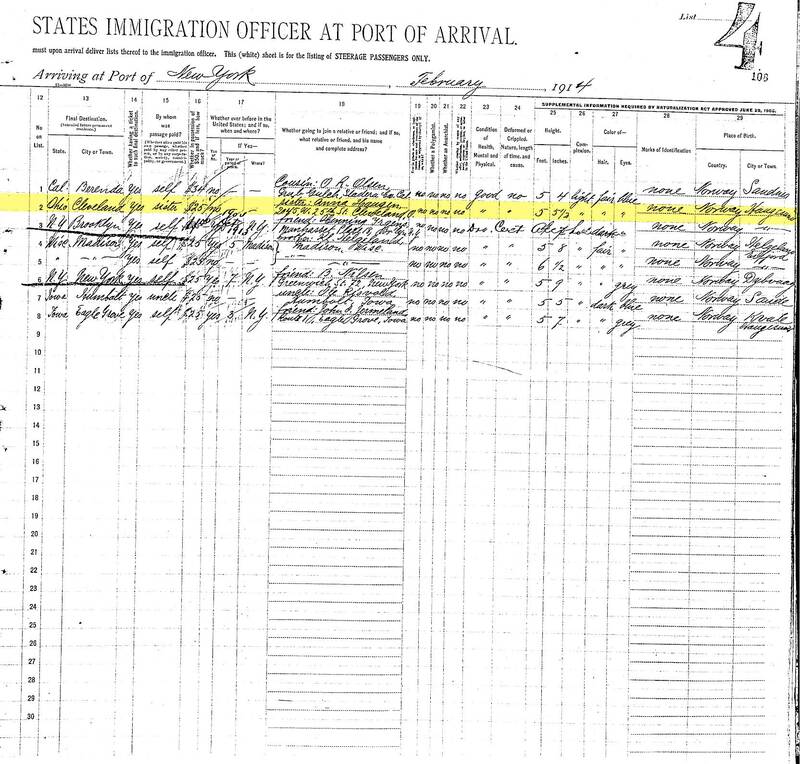 7 New York Passenger Arrival Lists (Ellis Island), 1892-1924 for Thora Haugen; "New York Passenger Lists, 1820-1891," "New York Passenger Arrival Lists, Ellis Island, 1892-1924", database, FamilySearch; from United States Immigration and Naturalization Service, Washington, D.C. NARA M237. FHL microfilm. Family History Library, Salt Lake City, Utah; S.S. Kristianiafjord; 7 Feb 1914; Entry no. : 2. 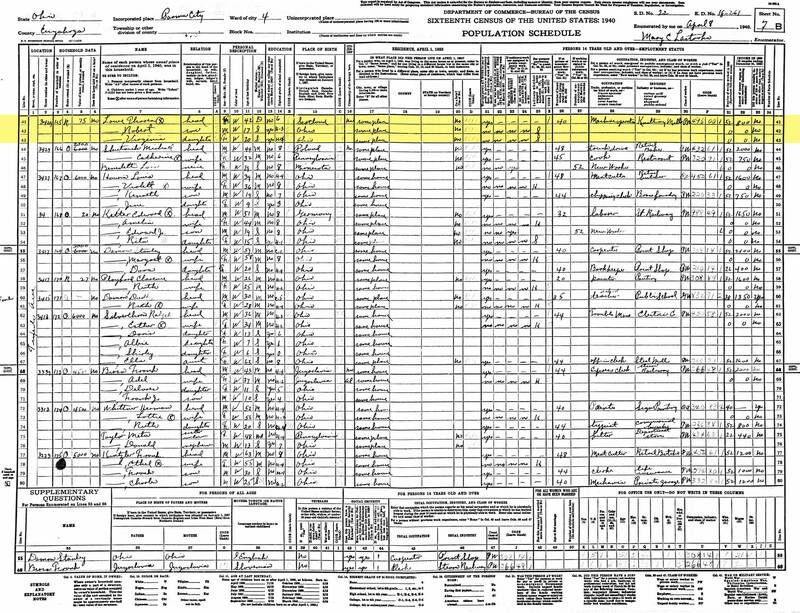 8 Ohio Marriage Record for Thora M. Haugen; "Ohio, County Marriages, 1789-1994," index and images, FamilySearch (https://familysearch.org/pal:/MM9.1.1/XDGC-ZYH : accessed 14 Jan 2014), Christopher Lowe and Thora M. Haugen, 02 Jan 1918; citing Cuyahoga, Ohio, United States, reference 124786; FHL microfilm 1888793. 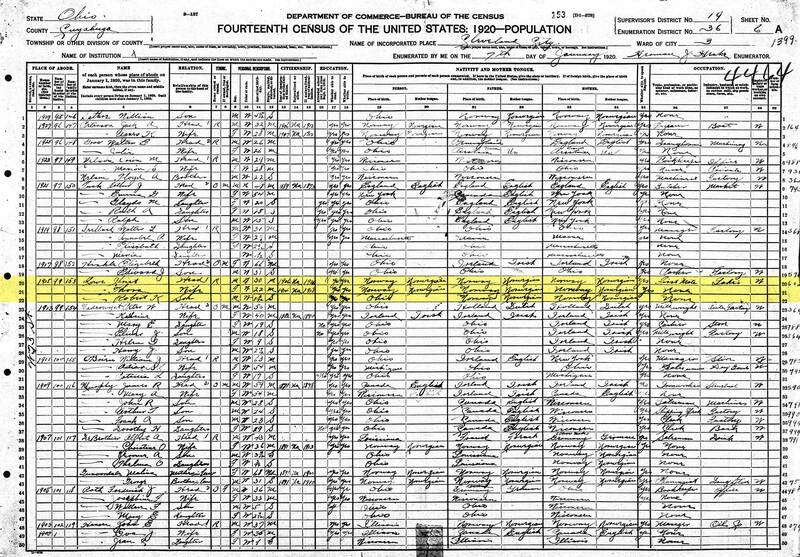 9 1920 United States Federal Census about Christ Lowe; Year: 1920; Census Place: Cleveland Ward 3, Cuyahoga, Ohio; Roll: T625_1360; Page: 6A; Enumeration District: 36; Image: 899. 10 Cleveland City Directory 1921-1922 about Christopher Lowe; Cleveland, Cuyahoga, Ohio; Cleveland Public Library, History Department. Cuyahoga County, Ohio; Identifier: F499.C6 A17X 1921; Published: Cleveland Directory Co., 1921; Printed volume, 3304 pages; Page: 1811. 11 Cleveland City Directory 1922-1923 about Christopher Lowe; Cleveland, Cuyahoga, Ohio; Cleveland Public Library, History Department. Cuyahoga County, Ohio; Identifier: F499.C6 A17X 1922; Published: Cleveland Directory Co., 1922; Printed volume. 12 Ohio Death Record for Christopher Lowe; "Ohio, Deaths, 1908-1953," index and images, FamilySearch (https://familysearch.org/pal:/MM9.1.1/X6Z1-KGN : accessed 14 Jan 2014), Christopher Lowe, 02 Oct 1929; citing Cleveland, Cuyahoga, Ohio, reference fn 62825; FHL microfilm 1992017. 13 West Park Cemetery Burial Record for Christopher Lowe; "Ohio, Cleveland Cemetery Interment Records, 1824-2001," index and images, FamilySearch (https://familysearch.org/pal:/MM9.1.1/K6WC-4X3 : accessed 24 Sep 2013), Christopher Lowe, 1929. 14 1930 United States Federal Census about Thora M Lowe; Year: 1930; Census Place: Parma, Cuyahoga, Ohio; Roll: 1788; Page: 10A; Enumeration District: 0687; Image: 143.0; FHL microfilm: 2341522. 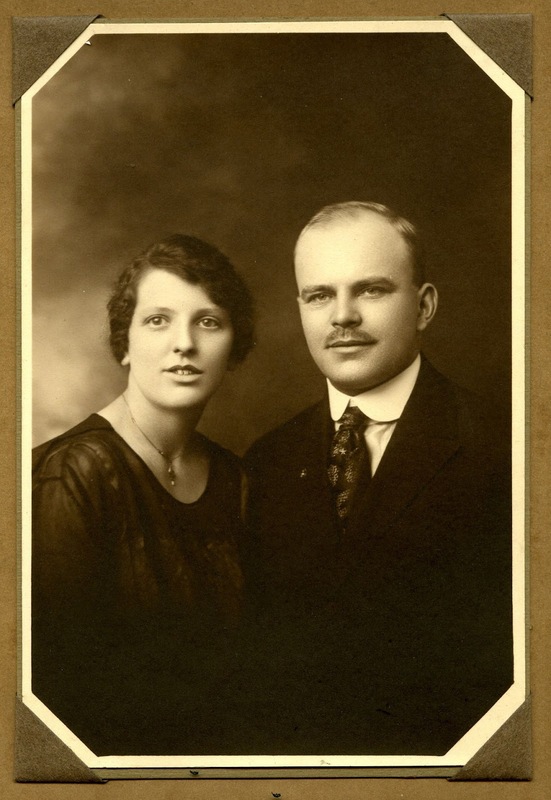 15 Ohio, Deaths, 1908-1932, 1938-2007 about Henry T Hanson; Ohio Department of Health. Index to Annual Deaths, 1958-2002. Ohio Department of Health, State Vital Statistics Unit, Columbus, OH, USA; Certificate: 54235; Volume: 15857. 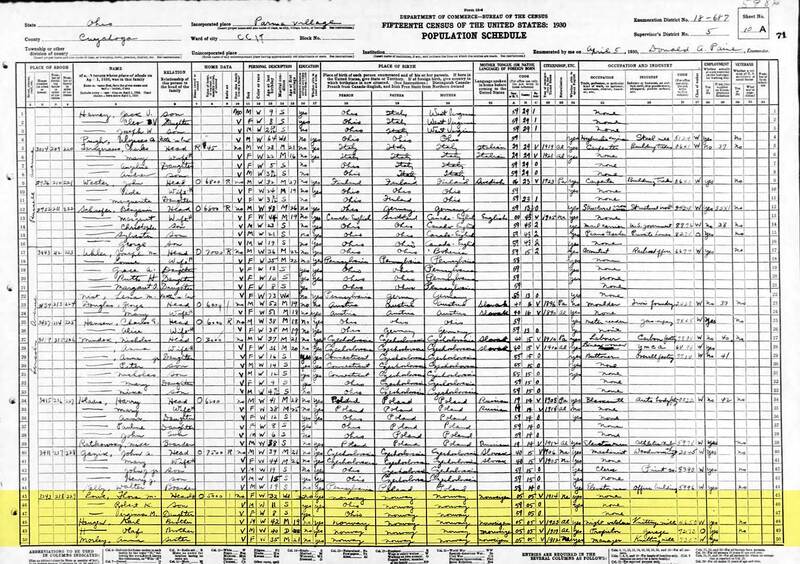 16 Ohio, Deaths, 1908-1932, 1938-2007 about Thora Marie Hanson; Ohio Department of Health. Index to Annual Deaths, 1958-2002. Ohio Department of Health, State Vital Statistics Unit, Columbus, OH, USA; Certificate: 073192; Volume: 29126.